Let’s start with one of the most well known UK pet insurers in Petplan*. While most pet insurance companies will offer a percentage discount, Petplan take a slightly different approach. With Petplan you can get a fixed amount of £12 off your policy per pet, per year. You can insure up to five pets on this basis including cats, dogs and rabbits. On top of this, Petplan also offer the flexibility to set individual levels of cover for each of your pets and to add additional care options where required. This should help to ensure that you only pay for the cover that you really need. Next we look at a slightly newer UK pet insurer in Bought by Many Pet Insurance. After spending many years helping its members harness the power of group buying in order to get the best insurance quotes, Bought by Many decided to create its own policies. The idea was to design policies that solved many of the common problems pet owners faced when insuring with others. As we mentioned earlier, when it comes to multi pet discounts most pet insurance providers offer a percentage discount. This is the approach Bought by Many have taken and they offer a generous 15% multi pet discount on their policies. In fact, this is the biggest multi pet discount available in the UK at the time of writing. Finally we look at the company who invented Pet Insurance back in 1890, Agria. Perhaps best known for their Lifetime Insurance cover, Agria also offer a multi pet discount of 5% when you insure more than one pet with the company. Agria insure cats, dogs and rabbits and you can easily get a quote online. 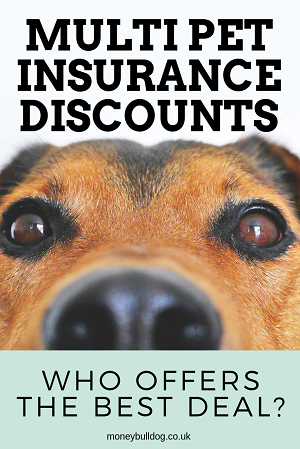 Hopefully this post has given you a good idea of where to find the best Multi Pet Insurance Discounts in the UK. As we can see, the discounts on offer vary quite a lot between insurers. Some offer a set amount off a policy when you insure more than one pet, while others offer a percentage discount. The amount of pets you can insure on one policy also differs from company to company. Also, don’t forget to do the maths when working out the true value of the multi pet discount being offered. If one quote is double the cost of another, for example, the even a 20% discount on the higher quote would not make it a great deal.